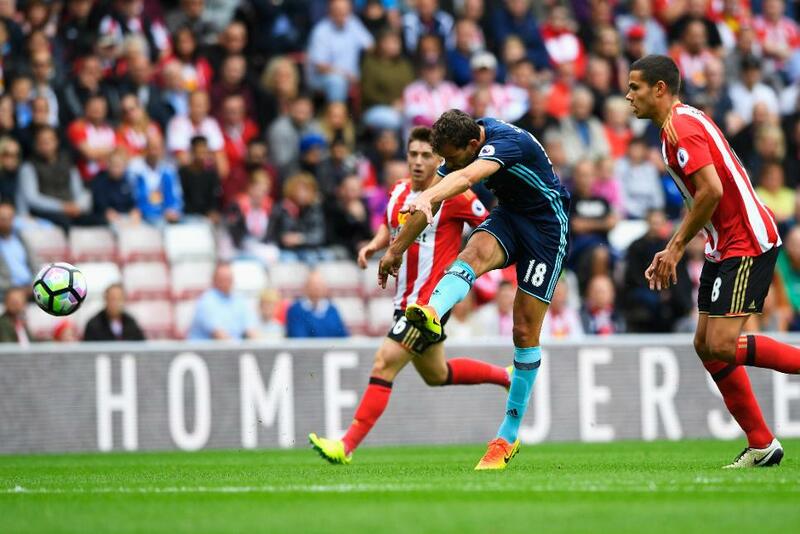 Middlesbrough earned their first Premier League win since their return after two strikes from Cristhian Stuani sealed a 2-1 victory over Sunderland at the Stadium of Light. The Uruguayan’s goals both came in the first half before Patrick van Aanholt struck on 71 minutes for Sunderland, leaving David Moyes seeking his first points of the season. There seemed little danger when, on 13 minutes, Stuani, one of three changes made by Aitor Karanka, picked the ball up from Alvaro Negredo 40 yards away from the Sunderland goal. But the Uruguayan advanced and unleashed an unstoppable shot past Vito Mannone. Sunderland put Boro under pressure but often their final pass was awry, with a cross by Lynden Gooch just eluding Adnan Januzaj and Jermain Defoe failing to find Duncan Watmore on a break. Things got worse for a home defence without Younes Kaboul, sold to Watford last week, and Lamine Kone, who was unfit, when captain John O’Shea was forced off after 36 minutes to be replaced by Steven Pienaar, signed on a free 48 hours earlier. Boro took advantage to double their lead just before half-time. A clever team move released Negredo in the penalty area and he fed Stuani to finish from close range. Moyes’s introduction of Jeremain Lens for Paddy McNair at half-time made a difference for Sunderland. Brad Guzan, who made his Boro debut for the injured Victor Valdes, made a great save from Van Aanholt’s 60th-minute shot. Five minutes later, Defoe looked set to score but his goalbound shot was blocked by Ben Gibson. The pressure finally told when van Aanholt followed up after Guzan could only parry Watmore’s shot on 71 minutes. Sunderland’s search for an equaliser petered out to give Boro their first Premier League victory over their North East rivals in five attempts.